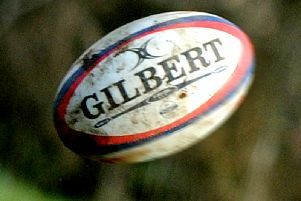 Olney cruised to the Midlands 2 East (South) crown on Saturday with a game still to play after running in a 50-29 win over Coalville. With an unassailable five point advantage atop the table with a game remaining, it means they secured the title a week early. Knowing victory would likely do the business, Olney made the first breakthrough after 15 minutes when Stu Livesey crossed the line to make it 5-0. Coalville though, who began the day fourht in the table, showed they would not roll over lightly and just two minutes later, took the lead when they scored their first try, kicking the extras to go 7-5 up. The try seemed to spark Olney into life though, and two tries in six minutes saw them retake and then extend their lead. First, on 24 minutes, Lloyd Sweeney broke through the line to touch down, with Jordan Marshall adding the extras. And on the half hour, Gareth Carhill was leading by example, making successive breaks and gaining metres. Olney made the next impression on the scoreboard, Marcus Goss finished off an attack, with a try in the corner. Olney were in again just before half time, this time when Glen White ran in under the posts, leaving Marshall with a simple conversion. Coalville scored their second of the afternoon before the interval to make it 24-12. The second half saw the teams go blow-for-blow in the early stages. Brendan Burke made it 31-12 10 minutes after the restart, but Olney were pegged back two Coalville tries reduced the gap to 31-22. Five minutes later, Carhill was once more in for Olney, only to see Coalville come back once more, with the scoreboard now reading 38-29. In the closing stages though, Olney would score twice more to confirm the win and the title. Goss ran in his second of the afternoon to open the gap to 43-29, before one final push at a scrum allowed Christian Caswell to cross the line. Marshall’s boot added the extras to see Olney reach a half century. With the league title secured, Olney travel to bottom club Huntingdon & District next week for the final game with the pressure off.